In Yoga with Melissa 369 on Chair Pose, Awkward Pose or Utkatasana, we will come into our own bodies. In order to balance and connect with our strength we will first relate to our proprioception. You will feel your skin, muscles, and joints. They all contain sensory receptors (proprioceptors) that are sensitive to stretch or pressure in the surrounding tissues. Your skin, muscles and joints or proprioceptors helps your brain recognize where your body is in space, even if your vestibular and visual systems are compromised. Proprioception means your skin, muscles, and joints all contain sensory receptors (proprioceptors) that are sensitive to stretch or pressure in the surrounding tissues. Balance also depends on your vestibular system. Sensory information about things like motion, equilibrium, and where your body is at in space is provided by something called a vestibular system. Your vestibular system is the part of your ear that includes the utricle, saccule, and three semicircular canals. The utricle and saccule detect gravity and front-to-back or side-to-side movement. In contrast, the semicircular canals detect rotational movement. Our visual system contributes to our overall balance. This is the ability of your eyes to figure out where your head and body are in space and also your spatial location relative to other objects. In yoga we often train with our eyes closed, therefore improving our proprioceptive system (our sense of self in space). And we can also spend some time improving and training our balance by playing with our visual system, opening and closing our eyes. David Whyte says from the inside we can often feel confused while we slowly learn what our life is about and what we really care about. We “allow our outer life to be realigned in that gravitational pull: with maturity that robust vulnerability comes to feel like the only necessary way forward, the only real invitation and the surest, safest ground from which to step.” In Warrior One or Virabhadrasana one we feel the gravitational pull, robust vulnerability and safe ground from which to step. Do you feel stronger and more balanced? Let me know by pressing that like button. Do you know somebody else who would like to feel more courageous, strong and balanced? Why not share this video with them? Thank you so much for your donations: Diane and Donna. Your donations help us do things like buy new hard drives to back up our videos. This past week we bought a 6 terrabyte hard drive delivered to help backup our videos. Thank you for your donations, your donations help to purchase that hardrive. 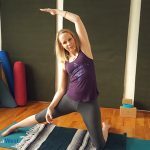 At the beginning of the yoga class I told you I I’m going to tell you where you can go to get more of the leading edge research and support for strength training and balance. I would recommend both our strength training series of short yoga classes for each day of the week and our brain yoga classes for balance in our membership community this week. These are shorter videos, most under 30 minutes for when you have less time to practice yoga.